Those little feet running around the house and your chasing after them can get pretty taxing after some time. As soon as your kid gets their first tooth, you are all smiles. Let’s forget for a minute the nights you spend awake because your kid is crying constantly from the teething. Right now, you have more pressing concerns. It’s time to start establishing a dental routine that will keep their teeth stronger as they grow. One of the most important things that parents should keep a check on is their kid’s eating habits. A glass of chocolate milk at night should always be followed with brushing. Unhealthy eating habits at a young age are what cause cavities in kids when they grow older. You might be thinking. “Flavored toothpaste... for kids?” Well, according to Colgate, there are no side effects to children swallowing toothpaste. Of course, you have to make sure that their brush has the right amount of toothpaste. To get your kid excited about brushing, get a flavored toothpaste that they enjoy and you will see them standing up every day on the dot, in the bathroom. Does your kid love doing what you do? All kids want to be just like their parents. So, to establish a routine, start brushing your teeth with them in the morning. Allow them to set their own pace when they mimic you in the mirror. Brushing your teeth vigorously up and down is what causes damage to the gums. There’s a technique to touching all the surfaces of the teeth: go in circular motions and keep a light hand. Set a time and tell them to brush for at least 2 minutes 30 seconds. Making your child agree to floss their teeth can be very hard. My kid bit me the first time I tried to floss for him. For kids, flossing is even more important because, at such a young age, they like to put anything eatable into their mouth they can get their hands on. The trick: offer them a treat to motivate them. That’s all it takes. 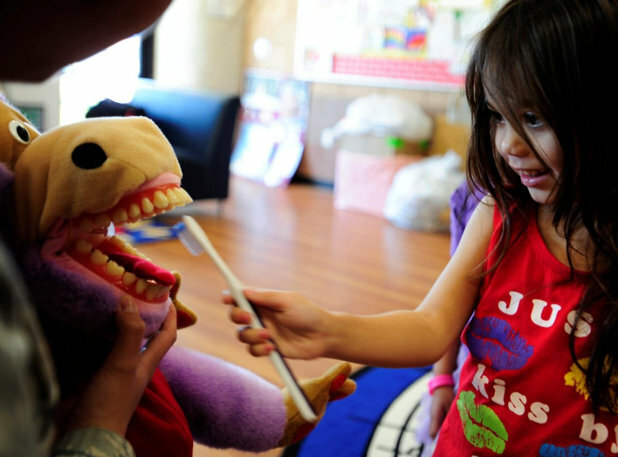 A visit to the dentist can be scary for children. The first encounter with the drill when they are 5 years old can traumatize them. So, before it gets to this point, get a dental check-up when they turn one. At a young age, steps can be taken to prevent tooth decay in the future. This will prevent cavities from developing that might go unnoticed. So, there you go... now you have five dental care tips that will not only help you keep your kid’s teeth clean but also help you teach them how to maintain this habit on their own.